Approaches to Space-Based Information Services Among Actors Without Space Capabilities. A Virtual Think Tank (ViTTa)® Report. Author | Editor: D. Bragg (NSI, Inc,). NSI’s Virtual Think Tank (ViTTa®) provides rapid response to critical information needs by pulsing our global network of subject matter experts (SMEs) to generate a wide range of expert insight.For this SMA Contested Space Operations project, ViTTa was used to address 23 unclassified questions submitted by the Joint Staff and US Air Force project sponsors. 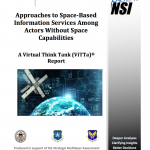 The ViTTa team received written and verbal input from over 111 experts from National Security Space, as well as civil, commercial, legal, think tank, and academic communities working space and space policy. Each Space ViTTa report contains two sections: 1) a summary response to the question asked; and 2) the full written and/or transcribed interview input received from each expert contributor organized alphabetically. Biographies for all expert contributors have been collated in a companion document. [Q4] What insight can the US/partners obtain from the space-based information service approaches used by international actors that lack their own space capabilities? Major General (USAF ret.) James B. Armor, Jr.2 (Orbital ATK); Mark Berkowitz (Lockheed Martin); Caelus Partners, LLC; Faulconer Consulting Group; Lieutenant Colonel Peter Garretson (USAF Air Command and Staff College); Gilmour Space Technologies; Dr. Namrata Goswami (Auburn University Futures Lab); Harris Corporation, LLC; Theresa Hitchens (Center for International and Security Studies at Maryland); ViaSat, Inc. The experts’ responses to this question suggest two main insights the US can draw from how actors without space capabilities approach space-based information services. The first relates to the information these actors are seeking: what it indicates about their interests and the potential security implications access to that information has for the US. The second relates to the strategies these states are using to gain access to space-based information, in particular collaboration and reliance on private sector services. Major General (USAF ret.) James Armor’s3 response to this question focuses on the observation that what actors choose to buy can provide insight into their interests. Consistent with this, the Faulconer Consulting Group, focusing their response on international actors as customers and/or as potential combatants, highlights the potential benefit to the US that knowledge of the service provider satellite type and capability provides. Specifically, it would enable the US to ascertain what type of information is of interest to other actors and thus draw conclusions “as to the need for that type of data/information and its attendant purpose.” Dr. Namrata Goswami from Auburn University Futures Lab identifies Luxembourg, UAE, Israel, and Iran as states that have all shown interest and capability in using insights drawn from space-based information services. 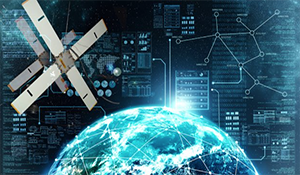 Mark Berkowitz of Lockheed Martin and Lieutenant Colonel Peter Garretson of USAF Air Command and Staff College both consider that the increased access to data that space-based information services provides raises security issues. The availability of high-resolution imagery from commercial providers combined with customized data-analytics makes it possible for actors to track military activities and capabilities as well as non-military factors, including those that could be used to manipulate economic stability (Garretson), without needing their own space capabilities. Berkowitz suggests that space-based information services can provide the US with insight into threats to intelligence sources and methods, force protection and operations security, as well as countermeasures to mitigate those threats. Theresa Hitchens of the Center for International and Security Studies at Maryland states that reliance on outside providers enables states to gain capabilities faster than they can through domestic development, thus resulting in more up-to-date technology. Furthermore, states currently developing space-based infrastructure have a variety of potential partners to choose from, and thus a wider range of capabilities to choose from. The ViaSat team notes that a similar logic applies to the US/partners, where private sector satellite services are faster to develop and deploy than are government systems, and result in more flexible architectures that allow for “near-instantaneous response to continually evolving cyber threats and related security concerns.” Leveraging private sector services enables international actors that lack their own space capabilities to rapidly improve their capabilities at a fraction of the time and investment of US/partners. Further, without adherence to installed base solutions, these international actors can adopt so rapidly that they could potentially surpass US/partner capabilities. Dr. Goswami notes that Iran, UAE, and China all jumpstarted their entry into space activities through partnerships with countries with more advanced space program and capabilities. The effectiveness of this strategy for China is reflected in the fact that it is now offering its own Beideu2 navigation systems to countries along the One Belt One Road (OBOR).4 In its contribution, Harris Corporation suggests that utilizing others’ space services also allows actors to benefit from “lessons learned,” making their own choices more cost effective. Brigadier General (USAF ret.) Tom Gould of Harris Corporation suggests, however, that security considerations may limit the potential for such collaboration in support of military operations, as it will require sharing sensitive information about each other’s capabilities in a domain that has traditionally stove-piped or highly classified its capabilities.